Durch Virtual Reality (VR) können Studenten der Northwest University in Xi’an, der Universität Nordwestchinas in der Provinz Shaanxi, archäologische Stätten „besuchen“, während sie im Klassenzimmer sitzen. 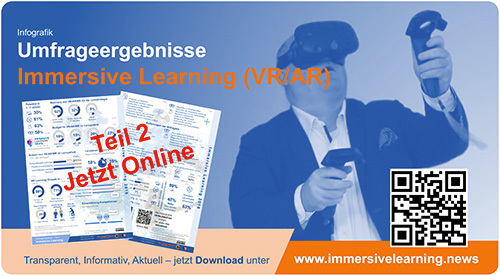 Die Universität hat ein VR-Lehrlaboratorium eingerichtet, in dem Ausgrabungsstätten rekonstruiert werden können und die Studenten die Merkmale verschiedener Ruinen beobachten und die grundlegenden Verfahren und Methoden der archäologischen Erkundung und Ausgrabung verstehen können. VR-Technik simuliert eine virtuelle Umgebung, die der Realität ähnelt. Mit Geräten wie Helmen und Brillen fühlt sich der Nutzer so, als wäre er tatsächlich an dem Ort, der simuliert wird. Ma Jian, stellvertretender Leiter der Fakultät für Kulturerbe an der Universität, erzählt, dass Forscher 3D-Modelle für dieses Projekt konstruierten, die auf den real erhobenen Daten in den Ruinen und Gräbern gesammelt worden sind. We know that virtual reality and augmented reality will help all of us in improving a lot of sectors of our lives. 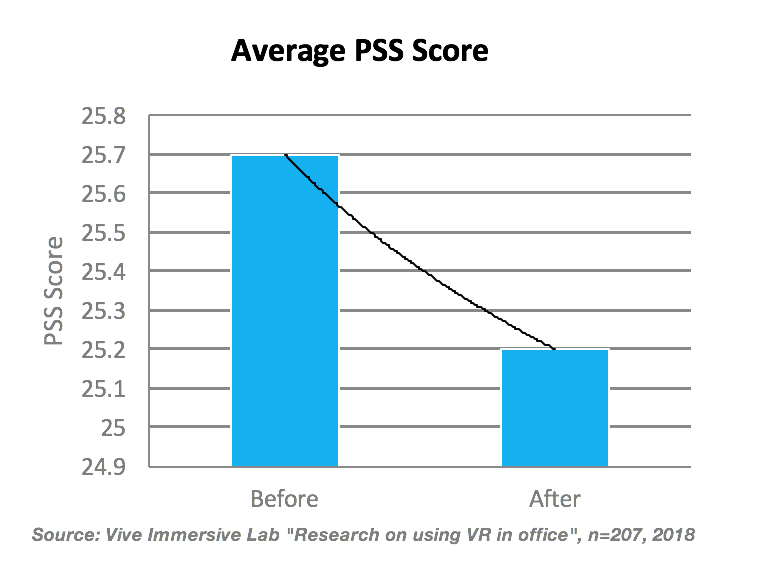 A new research by Vive Immersive Labs shows how it can be fundamental to make our office lives better. Let’s see how. Vive Immersive Labs has recently decided to verify if Virtual Reality could be used to make the life of white collars better. This meant tried to make these people have better working efficiency and a better quality of life, with less perceived stress. To perform this experiment, they supplied HTC Vive headsets (of course Vive Immersive Labs doesn’t work with Oculus Go :D) to 207 office workers in three Chinese cities: Beijing, Guangzhou, and Shanghai (three Chinese cities that are very distant the one from the others). These people were invited to live part of the office life from the virtual reality headset, to perform working tasks inside a virtual office in the headset. (the remaining 4.8% were the ones wanting a Go :D). But how have these results been achieved? And why VR can make office life better? Well, the reasons are many. This is one of the most important reasons that has led to the above results. In VR, every employee can create its own personal virtual office and work from inside there. So, for instance, even if he/she is working in a big corporate with lots of colleagues making noise around him/her, he/she could have a virtual environment where he/she is alone and in peace. He (let me drop the “he/she” from now on) could have a personal quiet VR space when he has all the privacy he wants, without other people seeing what he is seeing. This for sure can help the worker in feeling better inside his virtual office, with less stress given from all the hundreds people around him, without feeling always observed and without feeling his personal space as being only a cubicle. Furthermore, this personal space, being completely personal and private, could be customized to fit the tastes of the worker, making him feel more “at home” while being at work. I’ve said that the working environment could be customized however the worker wants. But since we are in VR, this would mean that every kind of customizations are possible, not only the ones that are possible in real life. 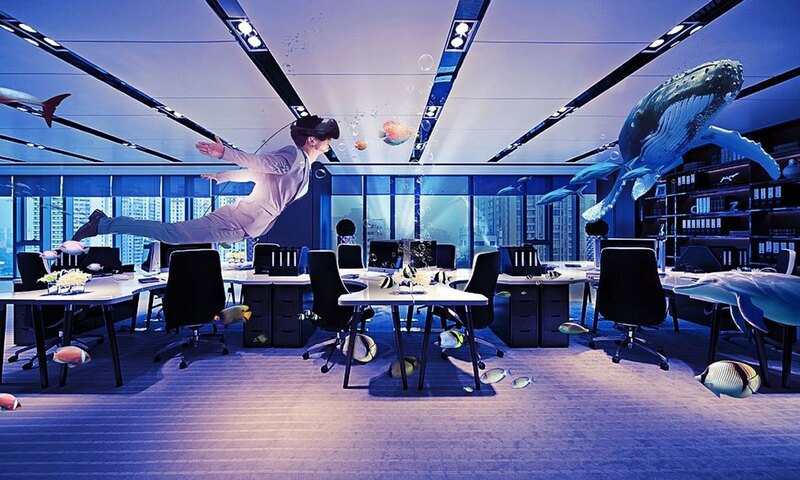 Do you want a whale swimming in your office? Well, with VR you can! This means that we can create custom virtual office environments that feel more relaxing for the workers, that so can have a better life in the office. Every one of us has a different idea of what is a relaxing environment (some people prefer the sea, others the night, others the wild nature, etc…), and with VR we can offer a customized environment for each user (this is what relaxing apps like Guided Meditation already do). It may seem strange for us the idea of working on a virtual desk that sits in a jungle or that stays underwater, but the above results prove that it may even be weird, but it does work damn well. If the virtual reality headset can be taken at home, the workers can even work from home and so spare the stress of the daily commute, with the classical screams in the traffic and the gentle squeezing of other people in the metro. This means sparing money, time and also stress. Expanding the above concept, people may work from everywhere. I am in Italy, but I could work easily for a company in Beijing through a VR headset. This means that talented people should not necessarily move to big cities of the world where there are more technological and financial development (e.g. Silicon Valley or Shenzhen), but could stay at home, leading to a more uniform distribution of talents all over the world. Meetings could be done in an efficient way by people from all over the world gathering in VR. We all know that a lot of companies (e.g. 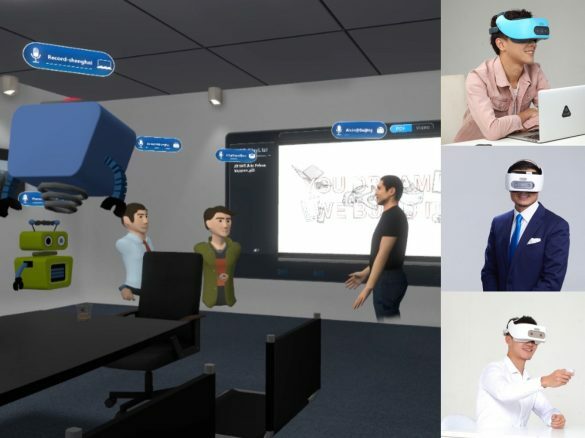 VR Waibao) are already working on virtual reality collaborative platforms and the reason of such a big interest is because VR meetings are fundamental to spare all the hassles of continuous business travels. VR meetings have also another added benefit we usually don’t think about: it may remove the stress of meeting someone in person. When meeting some important person face to face, we could feel embarassedof looking directly him/her in the eyes, of not being dressed in the proper way, of doing even the slightest wrong facial expression. Many psychologists also say that anxiety may arise from random expressions coming from the person in front of us (e.g. a puzzled face by our boss may make us feel in trouble). With VR, these issues are removed and this means that shy people could feel more comfortable of having meetings. This is something that is surely more important for the bosses than the employees. Since everyone can work at home and have the best office ever that suits their need… is there really the need of a physical office anymore? This is something similar to what has happened to stores. For centuries, people wanting to sell goods had to buy a physical space and sell products from there. Since when e-commerce has entered our lives, this rule has been canceled: a lot of guys and girls sell stuff on eBay without having a physical store, without the need to rent an expensive physical space. This has let a lot of people enter the commerce field easily. And with VR, we could have the same situation: maybe in the future companies wouldn’t need physical offices anymore and people will all work remotely inside beautiful virtual offices. This would make the creation of a company easier, enabling lots of talented people in becoming entrepreneurs. You may say that it is already possible now thanks to Skype, but trust me, this is not the same. Being present in the same space for coworkers is fundamental and just a Skype call once in a while hardly make people feel united. I’ve lived that on my skin. With VR, it would be possible for people to see each other side-by-side for all the office hours, exactly as they were in the same physical office, but without being in the same physical office. That is, with VR you can have both the advantages of being in the same physical space and of working from remote. 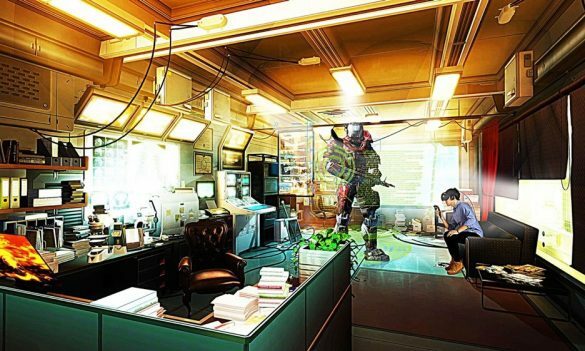 Of course, there are a lot of problems related to VR offices that have to be solved. For instance, current VR collaborative solutions can’t replicate the same level of interactions that are in real life yet and can’t even foster the same kind of relationships. Furthermore, VR headsets are still not comfortable enough to be worn each day for 8 hours straight. We are just at the beginning, and there is a long road in front of us before we will be able to substitute real offices with virtual offices. But the results obtained by Vive Immersive Labs show that we are in the right path to make office life better. Let’s work all together for it to happen. Zwei Jahre lang bilden Schüler der VBS Mödling sowie Schulen aus Italien, Griechenland, Estland „eine Klasse“. Am Montag erfolgte in der Vienna Business School (VBS) der Startschuss für das Projekt „Ausgewähltes Virtuelles Europa“, das gemeinsam mit Schulen aus Italien (Pugliatti), Griechenland (Patras) und Estland (Polva) abgehandelt wird. Das Projekt, das insgesamt auf eine Dauer von zwei Jahren angelegt ist, wurde von Nina Pippan, Englisch- und Deutschprofessorin an der VBS Mödling, initiiert und von der EU über das „ERASMUS“-Programm gefördert. Die Schüler werden sich während des Projekts aber nicht nur mit der Digitalisierung an sich, sondern auch mit EU-relevanten Themen auseinandersetzen und vor allem die Kulturen der jeweils anderen Länder kennenlernen. Während der Laufzeit des Projekts finden vier jeweils einwöchige Treffen der Schüler statt, einmal in jeder Partnerschule. Bürgermeister Hans Stefan Hintner, VP, freute sich über die Initiative, zumal „Mödling als Europa-Stadt schon seit 1956 einem Jumelagering angehört. Es ist wichtig, die europäische Idee auch über Schul-Projekte zu festigen“. EU-Abgeordneter Heinz Becker, VP, hält die Initiative für „vorbildlich. Ihr werdet erleben, was Europa bedeutet. Denn, wer Europa nicht würdigt, gefährdet die Zukunft des Kontinents“. Dass im Zuge des Projekts neben dem EU-Gedanken auch noch der Schwerpunkt „Digitalisierung“ im Mittelpunkt steht, hält der EU-Parlamentarier aus Perchtoldsdorf für „geradezu maßgeschneidert“. Das internationale „ERASMUS+Projekt“ mit dem Titel „Ausgewähltes Virtuelles Europa“ läuft bereits seit September. Die verantwortlichen Lehrer der Partnerschulen trafen einander bereits in Wien, um die gemeinsamen Aktivitäten vorzubereiten. Es geht unter anderem darum, kulturelle Unterschiede und Gemeinsamkeiten innerhalb der EU zu vermitteln – und das nicht nur mit traditionellen Lehrmethoden, sondern auch mit digitalen Hilfsmitteln wie Virtual Reality- und Augmented Reality-Apps (computerunterstützte Darstellung). Nina Pippan, Helmut Schramm, Hans Stefan Hintner, Veronika Erich, Stadträtin Roswitha Ziegler, Heinz Becker, Direktorin Marina Röhrenbacher und Gemeinderat Leopold Oswald. Am 12. Dezember 2018 fand die finale Präsentation der Ergebnisse im MariGreen Teilprojekt “ Training Technologies for the use of LNG“ im MARIKO statt. 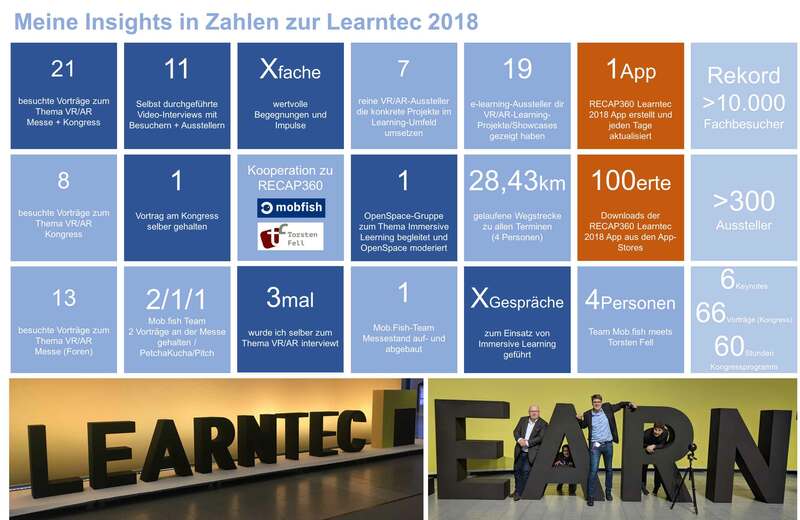 Da der Bedarf an Aus- und Weiterbildung im maritimen Bereich hinsichtlich neuer Technologien sehr hoch ist, war das Ziel des Teilprojektes die Entwicklung eines Online Blended Trainingssystems für die flexible, sichere und effiziente Schulung gemäß STCW V/3. Von Personal an Bord von Schiffen. Hierbei galt es zu untersuchen, auf welche Weise und mit welchen neuen Technologien dem nautischen Personal auf Schiffen, die LNG als Brennstoff gebrauchen, das beste Schulungskonzept angeboten werden kann. 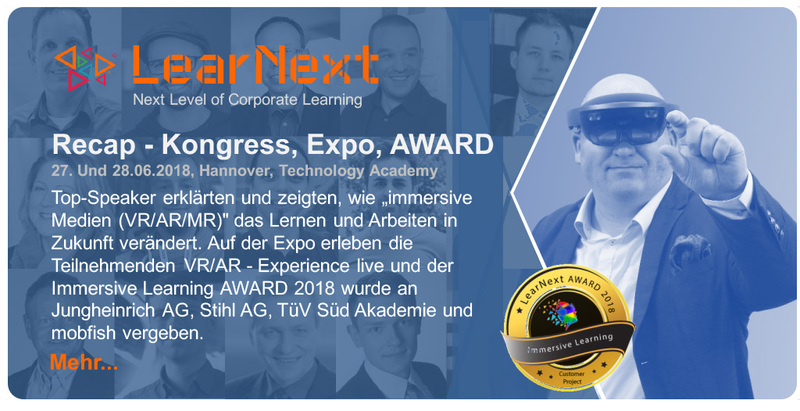 Die Projektpartner (Innovam, NHL Hogeschool, Hochschule Emden/Leer, DST – Entwicklungszentrum für Schiffstechnik und Transportsysteme) erarbeiteten im Laufe der Projektlaufzeit moderne Trainingsmethoden für das Handling von Flüssigerdgas (Liquefied Natural Gas – LNG) als Treibstoff an Bord auf Basis von Augmented und Virtual Reality. Das Handling von LNG als alternativen Treibstoff ist im Vergleich zu herkömmlichen Treibstoffen, wie Diesel oder Schweröl, sehr viel komplexer. LNG ist ein kryogener Flüssigbrennstoff und wird tiefkalt (- 163°C) und unter Druck gelagert und transportiert. Der Gebrauch von LNG bringt neue und komplexere Anlagen mit sich, die insbesondere bei falschem Gebrauch und Unwissenheit zu großen Risiken an Bord führen können. Bei einem Schiff, das LNG als Brennstoff gebraucht, werden neue Prozesse, Anlagen, Techniken eingeführt. Diese bislang unbekannten Prozesse weisen hohe Sicherheitsanforderungen auf. Die Herausforderung besteht darin, die neuen komplexen Technologien und Prozesse dem nautischen Personal zu vermitteln. Dies wird in einer Blended-Learning-Umgebung auf richtige und möglichst effiziente Weise gemäß den dafür geltenden Richtlinien der STCW angeboten. Als Test-Case für diese Technologien dienen ein LNG-Basiskurs und ein „Truck to Ship“-Bunkervorgang basierend auf der neuen LNG-Fähre der Rederij Doeksen und der „WES AMELIE“ von der Reederei Wessels. In der verbleibenden Projektlaufzeit werden Anforderungen für Zertifizierung und Vermarktung des Online Trainingssystems untersucht. NAVAL AIR STATION PENSACOLA, Florida – Teaching Airmen the how-to of protecting parts and planes just got safer and more efficient at the 359th Training Squadron’s Detachment 1 here thanks to virtual reality. Members of the detachment recently installed two 3D virtual reality paint trainers in their schoolhouse, which graduates about 1,200 Airmen annually in the aircraft structural maintenance, low observable aircraft structural maintenance and non-destructive inspection career fields. “The technology gap between using the virtual reality system and the real thing is almost one in the same, to the point where I train students here and I have to spend less time in the hazardous waste environment,” said Tech. Sgt. Kurt Brown, aircraft structural maintenance instructor. Maintainers require a respirator, hearing protection, eye protection and a chemical protection suit when they are inside an actual paint booth. That equipment isn’t necessary for the detachment’s VR training, which focuses on spray gun techniques. Until October 2018, Brown and fellow instructors alternated training between a two-dimensional simulator and two real paint booths. They thought VR could improve a student’s proficiency with spray guns, while simultaneously preserving resources and delivering motivated Airmen. Each VR system allows students to see themselves perform a task in playback mode. Students learn by seeing where they utilized improper technique, wasted paint, or where coverage was lacking. Students also get opportunities to paint an assortment of virtual equipment and utilize chemicals that match authentic materiel in the field. Instructors can track performance and adapt training objectives to match real world scenarios. Ultimately, students get more time to improve their techniques and the instructors said they have seen improved scores on tests as a result. “I’m able to train them and have more one-on-one time. I can instantly clear the paint. You don’t have to wipe it or wait for it to cure before sanding and blasting the parts with all the hazardous waste and chemicals,” Brown said. Each system costs about $32,000, which includes a computer, spray gun, HTC VR goggles, 65-inch television monitor, software and operator training with the system’s commercial vendor. This investment pays for itself within two years. Plans are to survey graduates and their supervisors in the field in the spring of 2019. That feedback will determine potential changes and improvements to future VR training. Virtual reality is widely recognized as offering the potential for fully immersive environments. This paper introduces a framework that guides the creation and analysis of immersive environments that are pedagogically structured to support situated and experiential education. The “situated experiential education environment” framework described in this paper is used to examine the impact that a virtual environment can have on the user experience of participants in a virtual space. 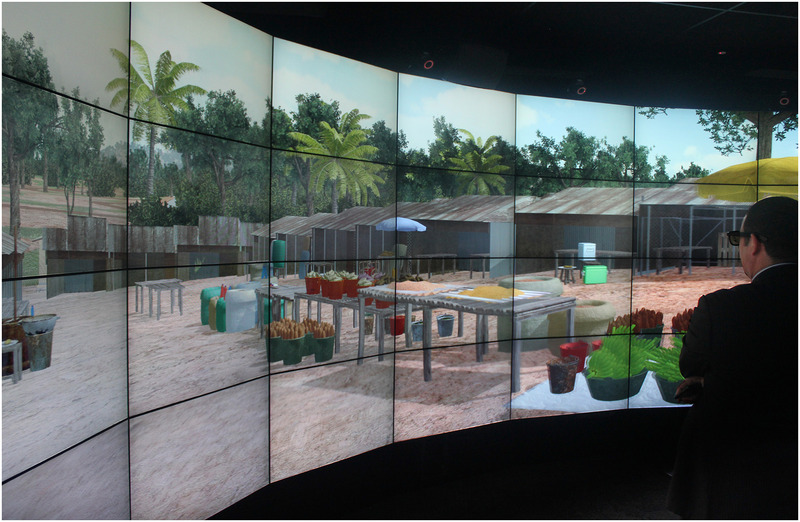 The analysis of a virtual environment implemented to support learner exploration of issues of tourism development and the related impacts, suggest that this type of experience is capable of providing participants with a holistic experience of real‐world environments that are otherwise too expensive, impractical, or unethical for large groups of people to visit in person. The pedagogical value of such experiences is enabled through immersion in a reality‐based environment, engagement with complex and ambiguous situations and information, and interaction with the space, other students, and teachers. The results demonstrate that complex immersive learning environments are readily achievable but that high levels of interactivity remain a challenge. Virtual reality (VR) technology is developing rapidly with interest from practitioners and researchers increasing concurrently. Although VR headsets are extensively researched in a gaming context, there is insufficient research examining the user‐experience of VR headsets in the context of education. 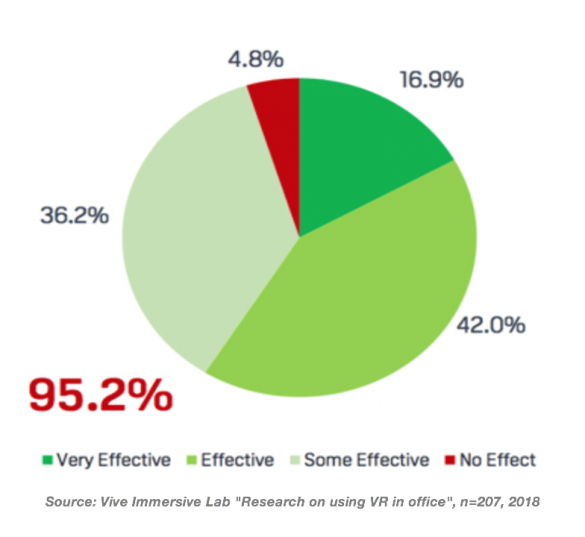 Users reported a multitude of positive features of the VR headsets in the context of experiential learning that is situated in a meaningful context, such as a Pacific island when learning about sustainable development. In particular, a strong sense of immersion was reported by users of the VR headsets. Additionally, the complexity of the material studied, an important feature of situated experiential learning, was also reported to high. Educational psychologists, including John Dewey and Kurt Lewin, have been promoting the benefits of experiential forms of education since the early 1900s. These benefits have been found to include the enhancement of student’s deeper subject knowledge (Chickering & Gamson, 1987), the increased engagement of students (Hanson & Moser, 2003; Schott & Sutherland, 2009), enhancement of student career decision making (Cantor, 1997), and the development of lifelong learners (Grabinger & Dunlap, 1995). Although predominantly used in primary and secondary education, experiential education has valuable applications in tertiary education. For instance, Kolb, Boyatzis, and Mainemelis (2001) note in a review article that Experiential Learning Theory (Kolb, 1984) and the related Learning Style Inventory (Kolb, 1971) have been researched in disciplines as diverse as Accounting, Computer Science, Education, Law, Management, Medicine, Nursing, and Psychology. This wide ranging application of experiential education is also reflected by the learning environments and tools commonly enlisted, which include residential fieldtrips and site visits, placements and internships, role play, and classroom‐based laboratory activities (Cantor, 1997; Healey & Jenkins, 2000; Wurdinger & Carlson, 2009). The pedagogy of experiential education then is well established at tertiary level, and recent rapid advances in technology present ever more sophisticated prospects to foster experiential education. A notable innovation has been virtual reality (VR) enabled through headsets, which provides the user with a highly responsive and fully immersive experience of a constructed virtual environment that is both visual and auditory. The overarching question guiding this paper is to what extent virtual environments implemented via VR headsets can provide opportunities for experiential education that is situated in a meaningful geographical and situational context. Adopting a user experience (UX) perspective (Hassenzahl & Tractinsky, 2006), this paper explores VR headsets as a tool for virtually positioning learners in a situated experiential education environment (SEEE), which we conceptualize into a framework as part of the literature review. Subsequently, the paper introduces a VR‐headsets‐for‐experiential‐education trial before mapping the user responses from the trial against the conceptualization of SEEE developed earlier in the paper. He continues to explain that learners are engaged intellectually, emotionally, socially, politically, spiritually, and physically in an uncertain environment where the learner may experience success, failure, adventure, and risk taking. Prominent pedagogical theorizations and definitions of experiential learning, which is a core component of experiential education, include Dewey’s three‐stage process of learning, Kolb’s cyclical learning process, Joplin’s action–reflection cycle, Williamson’s format for designing an experiential curriculum, and Kesselheim’s learning process. Stehno (1986) examined these five theories and formulated the following features of experiential learning that emphasize its inherently circular nature: action creates an experience, which is followed by reflection on both the action and the experience, which in turn triggers abstractions from the reflection, and ultimately new application of the abstraction.An important related pedagogy is situated learning (Lave, 1988) or situated cognition (Brown, Collins, & Duguid, 1989; Choi & Hannafin, 1995), which positions the learning process in the “real world” to provide meaningful learning and promote the transfer of knowledge. Situated learning theory posits that much of what is learned is specific to the situation and place in which it is learned (Greeno, Moore, & Smith, 1993). Equally, Choi and Hannafin (1995) promote the importance of context in tertiary education. They observe that abstraction and decontextualized learning leads students to experience problems when applying the knowledge and skill acquired to other contexts; bluntly stated, they note that “students may pass exams but be unable to apply the same knowledge in everyday circumstances” (p. 53). Further, Quay (2003) concurs that the situated nature of the learning process is very important; indeed, Choi and Hannafin (1995) emphasize the connections it creates between knowledge, skill, and experience, but Quay argues that situated learning is not sufficiently emphasized in dominant theories of experiential education, a sentiment we share. Drawing on the experiential education and situated cognition literature, as well as our own experience of this pedagogy, we conceptualize an SEEE as illustrated in Figure 1. The diagram positions the learner at the center of the environment and highlights the rich variety of experiences that the learner may be exposed to, ranging from intellectual to social and physical experiences (Itin, 1999). In terms of the environment, three key features are identified as essential for an SEEE: sense of immersion, interaction with teachers and other learners, and the complexity of what is studied. However, it is important to recognize that that each of these features can be present at differing levels of intensity; this aspect will be elaborated on at the end of this paragraph. First, a sense of immersion is central to an SEEE as the learner feels embedded in a specific situational and geographical context (Choi & Hannafin, 1995). This is a cornerstone feature of situated cognition and situated learning theory as outlined earlier (Greeno et al., 1993; Lave, 1988). In the VR literature, the terms immersion and presence are closely related and consistent with the pedagogical conception. Murray (1997, pp 98–99) defines immersion as a state where the user (the learner in this context) is surrounded with another reality claiming their complete attention. The resulting experience generates a sense of presence, defined as “the subjective experience of being in one place or environment, even when one is physically situated in another” (Witmer & Singer, 1998, p. 225). Second, interaction with teachers, and often with other learners, is an important component of experiential education (Dewey, 2004), as direction, transaction, and collaboration are core components of this theory (Itin, 1999). The importance of interaction between students and teachers, students with their peers, and interaction with the or content of learning activities has been recognized as a key feature of learning environments (Moore, 1993). The third feature is the complexity of what is studied and how this complexity is embodied in an environment or situation. Complexity in this model should be understood in pedagogical terms, rather than reflecting the technical or other affordances of an activity or assessment. Complex pedagogical tasks reflect a deliberate exposure of the student to experiences incorporating threshold concepts and “troublesome knowledge” (Meyer & Land, 2003). The intention is to help the students develop their thinking in more sophisticated ways, as, for example, reflected by the SOLO taxonomy (Biggs & Collis, 1982). SEEE activities provide a means by which students can engage with concepts from multiple perspectives, receiving information in multiple modalities simultaneously and seeing information in a rich and potentially confusing context. In both experiential and situated learning theories, the need for students to unpack and reflect on the interconnectedness of what they are observing is pivotal (Brown et al., 1989; Kolb, Lublin, Spoth, & Baker, 1986). Understanding and unpacking complex problems grounded in the real world are very challenging tasks in themselves but rendered even more challenging when attempted from the classroom setting or readings. When also considering the roles of universities as thought‐leaders (Dredge & Schott, 2013) and even critics of society, as for instance designated by the New Zealand Education Amendment Act (Harland, Tidswell, Everett, Hale, & Pickering, 2010), then the pedagogical merit of SEEE is clearly illustrated. Each of the three features can be present at varying levels of intensity, as guided generally by the course coordinator and aligned with the level of study and the identified learning objectives. For example, the level of interaction between the learner and the teacher/s will differ greatly in SEEE depending on the learning outcomes and whether independent learning is actively being fostered; higher and more frequent levels of interaction in the SEEE are generally more common in first year undergraduate courses than in Master’s courses. Depending on the broader purpose of the learning task, there can also be high levels of interaction with other learners, in the form of group‐assessed group work projects, or low levels of interaction, if every learner is tasked to explore the SEEE and reflect on that experience on their own. Equally, the degree of complexity exemplified by the environment/situation under study will vary from low to medium to high depending on the factors being modeled and the level of ambiguity or conceptual conflict they represent; indeed, the level of complexity demonstrated by the environment/situation is a central pedagogical decision for course coordinators when selecting the SEEE and will necessarily reflect the level of the course and the capabilities of the students. Although the level of immersion experienced by learners in SEEE is less variable than for the other two features, some nuanced differences are nevertheless present. Although an example of a high level of immersion is the presence of the learner in the situation and geographical setting under study, a lower level of immersion occurs when learners observe the situation and geographical setting under study from a short distance without being present in it. Examples could include the study of the realities and complexities of the relationship between North Korea and South Korea from a South Korean observation post that overlooks the demilitarized zone into North Korea and where only South Koreans are available to ask questions about the relationship. A particular challenge is ensuring that the level of immersion is balanced with the student’s requirements to engage in reflective activities that critique their interactions and experiences and provide evidence of achieving the learning objectives. 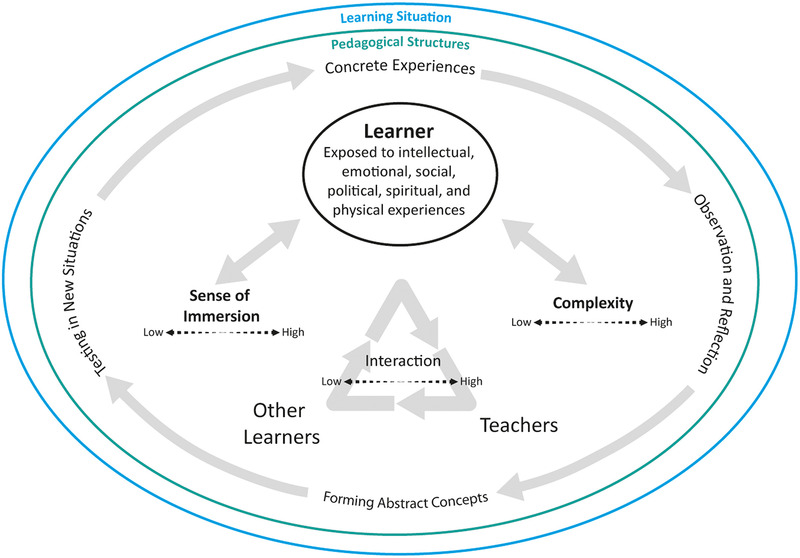 The pedagogical structures of the SEEE operate within the learning situation and encompass the mechanisms driving the experiential learning loop (Figure 1). These structures need to be purposeful and focused on supporting a learner in developing important outcomes through their iteration of the experiential loop. The alignment of the interactive, immersive, and complex features of the SEEE with explicit learning objectives reflects constructive alignment between the experience and the intended outcomes and learner goals (Biggs, 1996). Biggs describes this holistic view of the teacher, students, the learning situation, the activities, and the outcomes as an “internally aligned system” (Biggs, 1996, p. 350). Although in many cases, a real (nonvirtual) SEEE will deliver the greatest range of cognitive, affect, and skill outcomes, there are several incentives to consider the use of virtual SEEEs. These include the opportunity to allow students to virtually experience challenging‐to‐access or dangerous environments (such as working laboratories, commercial premises, remote rainforests, derelict mines, or sites of conflict), places where the presence of students would be disruptive to others due to practical and ethical concerns (such as a class of 100 students visiting a small village of 50 people) or indeed places that no longer exist due to natural disasters or armed conflict. Learning in virtual as opposed to real SEEE can also assist institutions with the management of constrained budgets (Stainfield, Fisher, Ford, & Solem, 2000), increasing concern about liability issues (Pearson & Beckham, 2005) and increasing work load pressures on staff (Dredge & Schott, 2013). Pedagogically, a virtual environment also has a range of desirable features including the deliberate creation of affordances linked to specific learning objectives, the ability to easily record and repeat experiences with or without variations intended to enable deeper learning, and the ability to provide feedback in context. 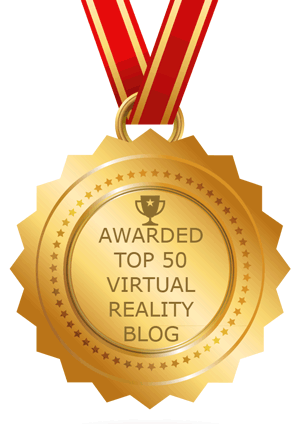 In comparison with the substantial body of literature on experiential education and situated cognition, the topic of VR for education is still in a state of emergence. A significant proportion of published educational VR research relates to the use of VR in medical education (Freina & Ott, 2015) including basic information delivery as well as more sophisticated simulations aimed at training surgeons (Aïm, Lonjon, Hannouche, & Nizard, 2016; Bric, Lumbard, Frelich, & Gould, 2016) or exploring public health (Ma, Jain, & Anderson, 2014). VR technology requires virtual worlds as the platform in which learning takes place. Educational virtual worlds combine a range of features that realistically display dynamic real‐world environments (representational fidelity) with interactive features designed to enable learning (learner interaction). In combination, these enable a range of learning modalities (Dalgarno & Lee, 2010; de Freitas, 2008). As noted earlier, a particular feature of virtual worlds is the creation of a sense of spatial immersion in the environment, leading the user to believe that they are present in a simulated environment, “spatial immersion occurs when a player feels the simulated world is perceptually convincing, it looks ‘authentic’ and ‘real’ and the player feels that he or she actually is ‘there’ ” (Freina & Ott, 2015, p. 1). Without a doubt, there is still a place for real‐world experiences in supporting embodied learning through sensorimotor experiences, but virtual spaces appear to be effective in supporting decision making and interaction as well as experiential learning (Loke, 2015). Virtual worlds in their modern sense consist of an illusion of a 3‐D space, representations of people within that space (avatars), and tools for communication between users (Dickey, 2005). The first examples of virtual worlds were text game environments that enabled users to play in different environments. Referred to as multi‐user dungeons, multi‐user dungeon object oriented, massive multiplayer online games, and massive multiplayer online roleplaying games, these evolved rapidly into sophisticated environments that included spaces simply created for unstructured creative play and socialization (multi‐user virtual environments [MUVEs]). Technological progress meant that MUVEs were able to transition during the first decade of the millennium into a three‐dimensional graphical space that directly represented an environment as moving images rather than text. The Second Life and related OpenSim MUVEs provided one of the first major internationally adopted virtual worlds supporting a diverse range of educational experiences (Penfold, 2009; Schott, 2012; Wang & Burton, 2013). More recently, other game environments such as Unreal and Unity (Rogers, 2012) have provided development tools that can be used to create stand‐alone virtual worlds enabling greater oversight and control by educators and institutions (Mathur, 2015; Potkonjak et al., 2016). The evolution of software to create virtual worlds has been accompanied by the evolution of tools used to experience and interact with such software. The screen, keyboard, and mouse have given way to a variety of technologies aimed at more completely replacing the real world with a virtual representation, including the mapping of a user’s hands into the environment (Wozniak, Vauderwange, Mandal, Javahiraly, & Curticapean, 2016). Perfect immersion in a virtual world is however still very much science fiction. A particular challenge is that despite decades of research and development, we still do not have tools able to render and display a completely immersive and believable virtual world without making significant numbers of users nauseous. Augmented reality tools such as the Google Glass (Torgovnick, 2013) and Microsoft HoloLens (Microsoft, 2015) are less prone to these issues and provide a limited degree of immersion but with significant limitations on the amount of information that can be provided. Another practical approach is to use consumer three‐dimensional products such as televisions to create immersive environments. Known as cave automatic virtual environments, or CAVEs (Kenyon, van Rosendale, Fulcomer, & Laidlaw, 2014), they consist of a large number of displays configured into a curved wall that when viewed with suitable polarized glasses, generates a simulated three‐dimensional image (Figure 2). Infrared gesture detection and the use of game controllers can render the environment interactive. CAVEs are however currently very expensive to install and maintain as well as limited in terms accommodating only about a dozen users at a time. Although these spaces have the advantage of allowing multiple people to visually experience an environment together, similar experiences can be achieved at far less cost by having multiple users talking with each other while independently exploring a virtual environment. Over the last few years, significant progress has been made in addressing the limitations and challenges of VR tools. Technologies such as the Oculus Rift and Vive headset have the ability to immerse people in a virtual world for much less cost than CAVEs. Importantly, the constant improvement in computing and graphics processing means that the necessary power is plausibly achievable using desktop computers in teaching laboratories or homes. Although research on virtual world experiences has been increasing over the last few years, there is a lack of theorization of how students learn in these environments (Loke, 2015) as most empirical explorations have focused on practical issues (Wang & Burton, 2013). Despite the potential benefits, the pedagogical literature on the educational impact of recent advances with VR headsets remains weak. Additionally, there is a dominance of self‐reported perceptions of effectiveness, without sufficient feedback from users of VR. Nevertheless, some of the more in‐depth studies have indicated that even earlier versions of VR can positively stimulate interaction (Roussou, 2004) and motivate students (Garris, Ahlers, & Driskell, 2002; Ott & Tavella, 2009). It is timely then to conduct research to explore VR headsets‘ effectiveness in virtually placing the learner in an SEEE. Adopting a UX perspective (Hassenzahl & Tractinsky, 2006), which considers the experiential facet, the emotion and affect facet, and the holistic and aesthetic facet, the paper conducts a trial of VR headsets for learning in an SEEE before mapping the participants‘ responses against the conceptualization of SEEE presented in Figure 1. The research comprised two stages. The first stage consisted of a range of university stakeholders (academics, professional staff, and students) “visiting” a Unity software‐based virtual island in Fiji by using the Oculus Rift headset. The second stage sought to explore through semistructured interviews what each respondent identified as the strengths and weaknesses of the experience as an SEEE. A total of 11 people, six staff and five students, responded to the invitation to participate; none had previously used a VR headset. Diverse cultural backgrounds largely reflective of undergraduate classes at the authors‘ business school were represented by the student respondents, which included two students of New Zealand European/pakeha background, one international student from Asia, one New Zealand Maori student, and one Pasifika student with Fijian background. Three were female and two males, which is again consistent with broader business school demographics. Staff respondents were evenly balanced in gender terms and included three cultural backgrounds: New Zealand European/pakeha (three staff), European (two staff), and New Zealand Maori (one staff). The roles held by staff covered the breadth of the university’s educational system and included associate dean, academic member of staff (with teaching and research responsibilities), and professional roles in IT and student educational support. The questions were designed to provide the interviews with a guiding framework while at the same time giving respondents the freedom to modify the sequence of questions and to add additional points. The interviews started by asking about respondents‘ initial impressions of the experience, followed by questions about the strengths and the weaknesses of the virtual SEEE. Each interview lasted on average 20 min, was subsequently transcribed, and analysed in Nvivo using thematic analysis (Braun & Clarke, 2006). The analysis process enlisted a combination of inductive–deductive reasoning (Fereday & Muir‐Cochrane, 2006) that saw themes from the literature combined with emergent themes from the interviews. The SEEE created for this project is a virtual Pacific island, which was recreated based on a real Fijian island using the Unity software platform. Because a sense of authenticity of the learning experience is a salient pedagogical feature of experiential education (Carver, 1996), great attention was paid to the following aspects: the size of the island, distances between buildings and natural features, geographic features and topography, the diverse range of natural and human‐made features, and importantly, the members of the village community who were represented through embedded videos. The videos contained recordings of community members as well as external stakeholders, such as government officials, talking about the island, its relationship with tourism as the main income earner, other sources of income, and their aspirations for the future of the island. As the process of exploring the island, finding community members to “talk” to, and interpreting the island’s features is user‐controlled, the experiential learning process students undertake is both inherent and implicit; characteristics that are fundamental to SEEE. The learning goals underlying the selection of the real Fijian island are to learn about life on this island and the concept of sustainable development. More specifically, the learning goals are to develop a deeper understanding of the three pillars of sustainable development (environmental, sociocultural, and economic considerations) and their interwoven and complex nature in the context of a small island developing nation; salient features of situated cognition. The experience of visiting a geographically distant island, and its environmental and cultural setting, then provides the context that constructively aligns the students‘ with these learning goals. As is common in small island developing states, tourism is an important feature of both the economic and social life, which is why sustainable development in the context of tourism was used as an example for the technology’s application to higher education. Specifically, the student task embraces the learning practice of conducting “fieldwork,” which has a long standing history in disciplines such as Geography and Geology, amongst others. It requires groups of three to four students to work together on three sequential tasks: (a) learning about the unfamiliar environment, life style, and views of its people and external stakeholders; (b) weaving theory from the course into what they have learned; and (c) arguing whether a sustainable development proposal should be developed and what form and shape it should take (for more details about the learning design and student tasks, see Schott, 2017). Although in‐world collaboration is desirable and currently being implemented, students access the island in “single player” mode and interacted with their group members in a variety of similarly effective ways to discuss what they observed and how it relates to theory. The communication and collaboration most commonly take places directly by being in close (physical) proximity to their group members; however, social media such as Facebook Messenger and collaborative platforms such as Google Docs are also used widely to collaborate after the students have completed fieldwork sessions. The virtual island environment is comparatively large taking users 2 min and 40 s just to walk from one end of the village (a pier) past the church and the community hall to the beach on the other side of the village (Figure 3). 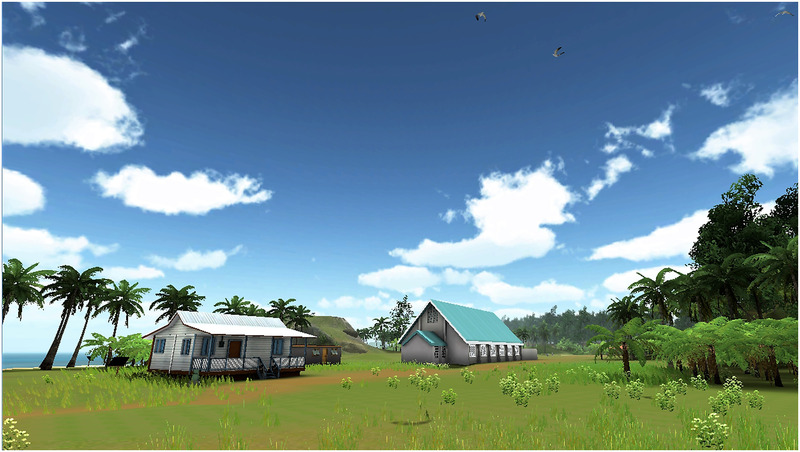 To develop the virtual island, a team of two, including one of the authors and a cultural research assistant, visited the real Fijian island on two occasions to collect all the necessary information and material for the development of the VR island; for more details about the development process, see Schott (2015). In order to provide an exploratory assessment of the effectiveness of the virtual island as an SEEE, the key findings from the interviews were mapped in detail against two of the three key features of SEEE: sense of immersion and the complexity of what is studied. Although equally important, the interaction feature of SEEE could not be substantially analysed as it was beyond the scope of this exploratory project. A strong sense of immersion was reported by more than three quarters of respondents. Many commented on a strong sense of place, which is critical in SEEE, “it actually made me feel like, pretty much you were physically there, which was really cool,” whereas other comments praised the strong sense of realism offered by this virtual SEEE, “beautiful like you actually felt you were standing on the rock.” Of the three quarters who mentioned a strong sense of place, most framed it in the context of the virtual world offering a holistic immersive experience, “at the end when I ran out to the pier you could stand on the pier, with the sounds of waves crashing against it, looking back at this massive, expansive coastline and village … it was amazing.” Additionally, just under half also discussed the realism of what they had experienced. Key aspects mentioned included animated content (relating to visual and auditory domains), the appeal of colours (visual domain), and tactile sensory responses reported by respondents. The term “real” was commonly used by respondents, but it became evident during the analysis that respondents construed “real” with reference to two different conceptualizations. One conceptualizes real in the context of the Fijian island and community on which the virtual island is based (authentic), “I think that you are literally putting yourself in Fiji, to me that is an incredible strength,” whereas the other refers to respondents feeling meaningfully immersed in a place that is understood to be artificial, “it’s like playing a game. It’s like being there in real life … (but) it’s more like playing a game.” Both conceptualizations have value in the context of immersion and immersive learning; however to foster SEEE, the former is the version of “real” that virtual SEEE needs to be able to deliver. A different perspective on the notion of complexity in learning was offered by a respondent with a strong interest in culture. She talked about the opportunities provided by the virtual SEEE in comparison with navigating the complexities of visiting a real SEEE without the ability to speak the language and being unfamiliar with the culture protocols, “it was so rich because you had someone translating and you had [the video] in that indigenous voice [videos were commonly recorded in Fijian and supported by a sub‐text translation] … If I am in any island and I wanted to experience something cultural I would have to find myself a translator for the start, how would I get into this island? What is the cultural way of doing that?” Although meaningful access to the community, their culture, and everyday life was an important consideration in the development of the virtual island, the authors did not expect this aspect to be recognized as soundly as it was by this respondent. It would indeed be difficult to be invited into the portrayed community and to overcome the language barrier as a nonspeaker of Fijian; the project team spent several months planning the logistics and consulting the community elders about the cultural protocol and mutual expectations for the research visit. The project team included a staff member who speaks not only Fijian but also the local language and has a deep understanding of the cultural protocols of Fiji’s Western islands (see Schott, 2015). The benefit of visiting a virtual SEEE to avoid contributing to the very issues being studied was also raised by a respondent. Both the environmental and cultural impacts are minimal when 100 people visit a virtual SEEE compared with the same number of people conducting a one week visit to a real SEEE in or around a small village; the only impacts created by the virtual SEEE occured when the project developers visited the real environment to collect all the necessary material and information for the development of the virtual world. As such, the respondent raised a significant point about the complex issues that arise from visiting small communities in remote locations where the economic impacts, which are commonly positive, are accompanied by significant sociocultural and environmental impacts, which are commonly negative. Complexity then is clearly recognized by respondents as an important feature of the virtual SEEE. Universities across the world are welcoming an increasingly diverse student community into their faculties and departments, and as Altbach, Reisberg, and Rumbley (2009) posit, “an increasingly diverse student body also creates pressure to put in place new systems for academic support and innovative approaches to pedagogy” (p. x). Innovative approaches should include tools that serve traditionally focused learners as well as those who have a more kinaesthetic (active), visual, inductive, sensing, and global learning preference (Felder, 1993). VR‐based opportunities for situated experiential education should be considered in this context as they combine established educational philosophies from the 20th century with 21st century technological innovation. The interviews exhibited strong support for the provision of diverse learning opportunities to match students‘ diverse learning preferences. Respondents commented that VR provides effective opportunities in this context, by making SEEEs available to learners in an era of less real fieldtrips and site visits for students. Aligning the trial and subsequent interviews with the literature‐based conceptualization of an SEEE, as outlined in Figure 1, the findings will now be discussed with reference to the two key features of SEEE that are the focus of this paper, sense of immersion, and complexity of material studied. Overall, a strong sense of immersion was reported by respondents. This was in part attributed to the headset’s responsiveness to the user’s instinctive head movement as well as a strong visual appeal and depth perception of the large virtual SEEE visited. Aspects that were particularly emphasized in this context were the bisensory appeal of detailed high‐resolution visuals and situated animated content, coupled with realistic and appropriate sound throughout the island. This was reported to invoke both a strong feeling of immersion and fidelity in the respondents. When mapping the findings on to the intensity scale in Figure 1, the sense of immersion experienced by the respondents can be summarized to be around the elevated midlevel of the scale as certain sensory stimuli are strong while others are absent. When refining the virtual SEEEs further, additional senses should be catered to in order to increase both the user’s sense of immersion and to enhance the complexity of the material and situation under study. 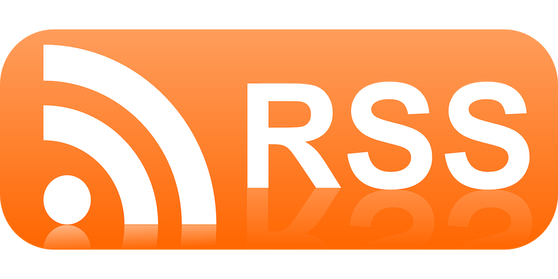 For example, the tactile domain in VR, which is gaining increasing research attention in neuroscience (de Jong, Keizer, Engel, & Dijkerman, 2017), could be incorporated through the use of a small selection of meaningful real items that are connected to appropriate places in the virtual world and can be picked up by learners; in the case of Fiji, these items could include the culturally important carved kava bowls, Pacific sea shells, and/or coconuts. Additionally, there is evidence that thermoceptive stimuli in the form of heat create a more immersive experience for the user than merely providing a visual stimuli in the virtual world (Jones & Dawkins, 2018). Smell, or more aptly olfaction, has been successfully used in a museum context for several decades to create multimodal exhibits. Examples include cigar smoke in the Britain at War experience and the American Museum of Natural History that uses gunpowder smell and odours of the tropical rain forest (Stevenson, 2014). There is consensus that the presence of smell can have a major impact on the sense of immersion (Jones & Dawkins, 2018) as well as our ability to memorize a situation or environment (Chalmers & Zányi, 2009). Of particular significance in an educational context is Aggleton and Waskett’s (1999) finding that exposure to odour cues lead to a highly significant improvement in recall of a museum’s content, even though the interval between the recall test and the last visit to the museum can be a full 6 years. The integrated and complex nature of the material studied in the virtual SEEE’s also received considerable attention by the respondents, thus validating that this key feature of SEEE was clearly embodied by the virtual world. As discussed earlier, the level of complexity commented on by the respondents can be classified as relatively high on the scale in Figure 1. This is because complexity is discussed not only in relation to the detailed nature of the SEEE and situation under study but also in the context of the complexities and ethics inherent in a visit to the real SEEE, and how this would contribute to the challenges already faced by the island. The nature of the discussed complexities also suggests that the pedagogical aims of the SEEE are being supported, with students reporting awareness of the interplay of factors affecting tourism development in the island. The last of the three major elements of the model presented in Figure 1 is interaction. The current version of the VR environment is restricted to “single player” mode, which limits the direct human interaction possible “in‐world” but there are opportunities for passive interaction with local people in the simulation, and students are able to engage actively with each other and teaching staff as they debrief and process their experiences. The environment itself is also interactive to the extent that students can make choices about their movements and when engaging with the activities provided. Other SEEE VR environments could provide greater interaction as technological improvements enable multiple simultaneous users; some of which could be teachers acting in roles or artificially intelligent agents that respond according to defined parameters. Situated experiential education is an important pedagogical approach for the many disciplines that seek to expose students to real world, complex problems as part of their curriculum. The ongoing development of VR technologies is enabling motivating learning activities with high levels of fidelity to be offered at a relatively low cost. The paper’s assessment of the key features of SEEE, as conceptualized in Figure 1, highlighted that the virtual Fijian SEEE “visited” by using the Oculus Rift VR headset embodied both complexity and provided a strong sense of immersion; but only limited interaction. Although limitations with regard to these features are acknowledged in the context of the virtual SEEE, the logistical, resourcing, and ethical implications of a real visit to an SEEE versus a visit to a virtual SEEE also need to be considered here. Figure 1 provides a framework for elaborating the design of SEEEs and ensures the various components combine to create a pedagogically integrated system that stimulates student learning. This study reports on the experience of a relatively small group of users, and as such, the findings should be seen as indicative rather than as establishing an empirical evidence base. Research with a larger group of users is needed as well as with different VR headsets to explore whether differences exist between headset models with regard to the UX of virtual SEEE. For all forms of situated experiential education, the environment, situational context, and learning activities are critical, and the SEEE framework presented in Figure 1 emphasizes the need to consider whether the learning activities aimed at developing students‘ intellectual abilities are pedagogically robust, balancing immersion with effective educational interaction and cognitively complex experiences. As this important aspect was beyond the scope of this paper, targeted research is required to examine it in depth in the context of virtual SEEE and to develop a broader theoretical framework of pedagogically sound learning activities in virtual SEEEs. Other areas for further research include a more targeted assessment of the third key feature of SEEE by examining the important interaction feature in virtual SEEE, both with regard to interaction with other students and the teaching staff. This project was funded by a Victoria Business School (Victoria University of Wellington, NZ) Teaching and Learning Innovation Fund. We are grateful to the people of Yasawa‐I‐Rara and Bukama for their hospitality and for participating in this project. Additionally we wish to acknowledge for the excellent digital design work by Alan Proctor‐Thomson (Burnt Pixel) and the cultural advice and translation provided by Maciu Raivoka (VUW Centre for Lifelong Learning). The research documented in this paper was approved by the Victoria University of Wellington Human Ethics Committee. Realitätserweiternde, computergestützte Applikationen könnten das Lernen und Verstehen komplexer Sachverhalte positiv beeinflussen, davon sind die Verbundpartner von »AuCity 2« überzeugt. Wie die Technologien künftig eingesetzt werden können, untersucht das interdisziplinäre Forscherteam am Beispiel des Studienganges Bauingenieurwesen. Bis Februar 2022 erhält das BMBF-Projekt rund zwei Millionen Euro Fördermittel. Unter Mixed Reality (MR) werden Umgebungen oder Systeme zusammengefasst, welche die natürliche Wahrnehmung des Menschen mit einer künstlichen, digitalen Wahrnehmung erweitern. Dabei werden reale Objekte und Räume wie beispielsweise Straßen, Brücken oder Gebäude mit zusätzlichen, computergenerierten Informationen wie Formeln oder Erläuterungen ergänzt. Auf diese Weise werden verborgene Einflussgrößen wie Bodenstruktur, CO2-Ausstoß oder Thermodynamik für den Betrachter sicht- und erlebbar. Insbesondere in ingenieurwissenschaftlichen D isziplinen bieten erweiterte, virtuelle Realitäten daher vielfältige Einsatzmöglichkeiten: »Mixed Reality-Technologien ermöglichen es, räumliche Informationen realitätsnah in drei Dimensionen abzubilden und Interaktionen zwischen Lernenden und Objekten im virtuellen Raum zuzulassen«, erläutert Projektleiter Prof. Dr.-Ing. Jörg Londong von der Bauhaus-Universität Weimar. Überzeugt vom Potenzial der Technologie, werden MR-Anwendungen wie die App »AugView« bereits seit dem Wintersemester 2017/18 testweise in die Lehre der Fakultät Bauingenieurwesen eingebunden. So analysieren und planen die Studierenden beispielsweise in fiktiven Szenarien die Wasserinfrastruktur der Stadt Weimar. »Durch den unmittelbaren Bezug zur Realität wird die Komplexität abstrakter Sachverhalte reduziert, wovon besonders Lernende mit geringem Vorwissen oder geringem räumlichen Vorstellungsvermögen profitieren«, erörtert Prof. Dr. Tina Seufert, Institut für Psychologie und Pädagogik, Abteilung Lehr-Lernforschung an der Universität Ulm. 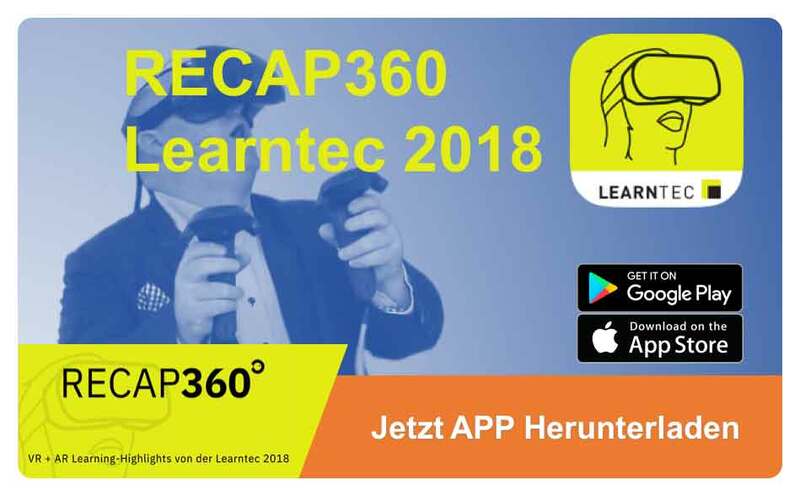 Im Rahmen des Projektes sollen verschiedene Anwendungsszenarien von Augmented Reality (AR, Erweiterte Realität) und Virtual Reality (VR, Virtuelle Realität) – zusammengefasst durch den Begriff Mixed Reality (MR) – stufenweise umgesetzt und deren Auswirkungen auf den Lernerfolg der Studierenden gemessen werden. 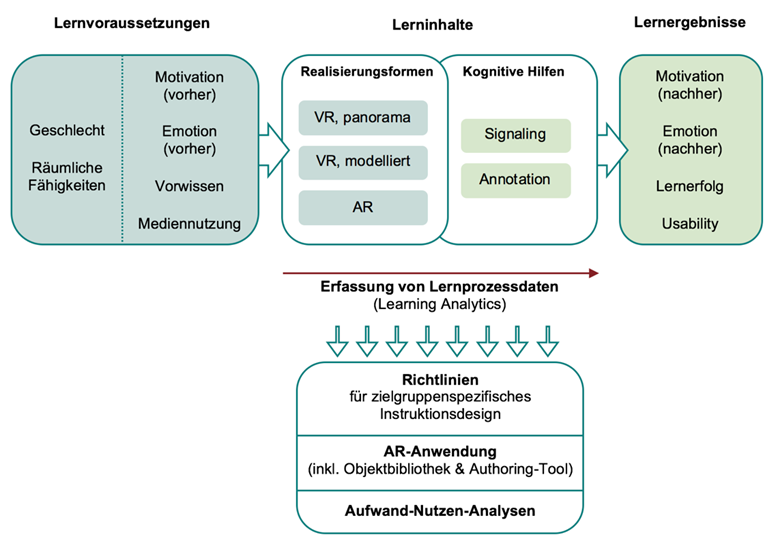 Bei der Erstellung, Evaluation und Visualisierung der MR-Inhalte arbeiten Wissenschaftlerinnen und Wissenschaftler der Ingenieurwissenschaften, Psychologie und Medieninformatik beider Universitäten Hand in Hand. Dawoud Al Hajiri, Director-General of the Dubai Municipality, on Monday launched a smart training centre, which offers hands-on training using the Virtual Reality Environment. The Smart Training Hub, supervised by the municipality’s Geographic Information Systems Centre, is considered the first-of-a-kind in the Middle East for the city planning and engineering industry. With the Smart Training Hub, the municipality aims to enable trainees to learn the techniques and mechanisms used in urban planning and the methods of building supervision and control. The techniques of the centre will also enable the trainees to implement the urban planning rules and the setting up of building regulations as well as performing the land surveying tasks while they are inside the training room. Al Hajiri toured the training centre, where he was briefed by Mariam Al Muhairi, Director of GIS Centre, about the equipment and training programmes at the centre, which is unique for its use of the latest technology in training. The centre is equipped with high-end devices and tools that are used in VR technology, while the software was fully developed by the GIS Centre team. Al Muhairi explained that the training curriculum covers limited fields for the time being such as urban planning, land surveying and building supervision, while in the future it is expected to include other training topics to cover other DM specialty areas. She added that the centre will be available to the departments and institutions to benefit from it as per their specialisations and fields of work. Al Hajiri expressed his happiness at the use of modern and smart technologies in training and qualifying the trainees and raising their levels in urban planning. VR training systems company VR Motion Corp and automotive giant Jaguar Land Rover are each trialing a new device called ‘OtoTech’ which is claimed to solve VR locomotion-induced sickness. Motion sickness is caused when the balance signals from your inner ear disagree with the visual signals from your eyes. In VR games with locomotion simulated by a handheld controller, your eyes see movement but your inner ear doesn’t feel it, because you’re not really moving. 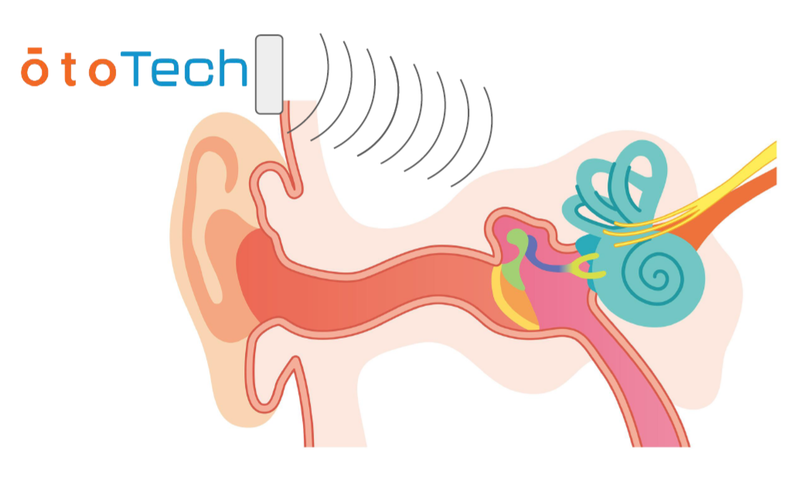 OtoTech was developed by Samuel Owen through his new company Otolith Labs. Strapped in just behind the ear with a headband, the non-invasive gadget generates vibrations against the inner ear nerve responsible for transmitting balance information to the brain. Owen says the device is comfortable and “virtually silent”. Owen believes the vibrations flood the inner ear with “white noise” and that it causes the brain to ignore the input from the inner ear. Owen said they’ve observed no other effects of the gadget other than your your brain being more comfortable with simulated movement. Don’t confuse this with galvanic vestibular stimulation (GVS) which we’ve reported on in the past. GVS uses electrodes to send electrical signals that simulate the direction you’re moving in VR- OtoTech uses “white noise” vibrations. 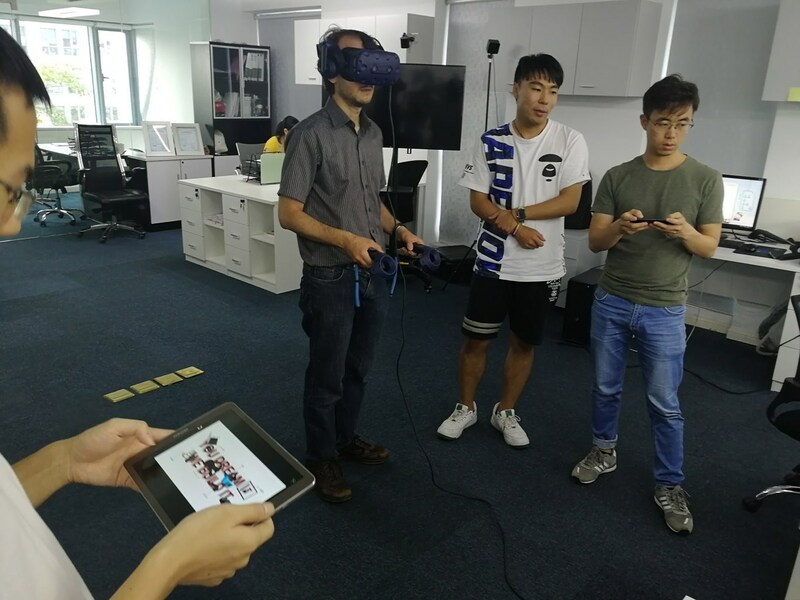 Owen’s device attracted attention from VR training systems supplier VR Motion. VR Motion provides virtual driver training systems to the USAF, among other clients. CEO Keith Maher told us that they have historically seen a 20-30% sickness level among trainees. Recently, the company started using the OtoTech in their systems. Maher said he doesn’t want to make any claims before Otolith receives FDA approval, but that it “enhanced the VR experience” for their clients, and that they haven’t seen any side effects at all. Researchers at Jaguar Land Rover conducted a double blind study of the device which was submitted to the Journal of Vestibular Study. Owen tells us that, based on the “positive results” of this study, which could be published early next year, a second study is being planned with Coventry University. This isn’t the only time this technique for mitigating VR sickness has been studied. Back in March, researchers at Queen’s University in Canada published a study in the PLOS ONE journal to assess the effectiveness of the idea. Their results were also positive, finding that it worked across a range of virtual scenarios. Owen said the solution works seated or standing and that he’s focused on getting FDA approval for the device’s sickness prevention claims. If this technology ever makes it to the consumer market, developers could make large open world environments that players could move around in with a controller without worrying about feeling discomfort. We are optimistic but skeptical until the results of the trials of this device are made public. Even if it works, it is possible that the technique only works for certain people, or that it only works for particular types of virtual motion. We’ll keep you updated on any further news about OtoTech or any other devices using a similar technique. UPDATE: Spaces co-founder Brad Herman sent us a patent application from 2014, when he and his co-founder were at DreamWorks Animation, that describes a similar concept to the OtoTech. Interestingly, Otolith’s own patent references this DreamWorks patent.